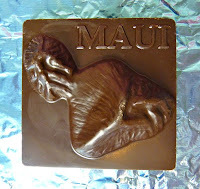 Today was Day #5 of Chocolate and Hawaii/Islands Theme Week. 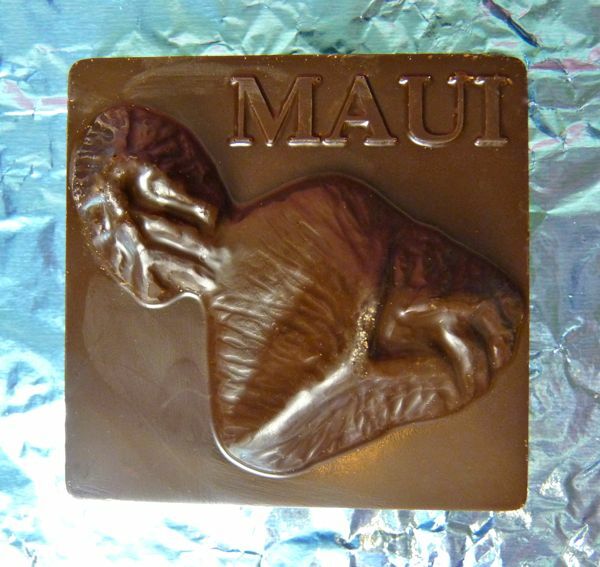 The island of Maui was featured yesterday, in milk chocolate form; and today's chocolate is the same island (mold), but in dark chocolate. Molded chocolates are generally formulated for looks (smooth firm surfaces) and staying power, vs. being optimized for maximum taste (which I sometimes associate with softer, more rustic or textured variations on dark bars). That said, this wasn't bad. With this aerial view of Maui, it was easy to imagine coming in for a landing at Kahului airport in Hawaii. Aloha.